I’m not gonna lie….there are a few things I really miss since my husband and I took the gluten free plunge. Most of the time, I just try to find recipes that are naturally gluten free because I think it’s pretty hard, in many cases, to live up to the original. But, there are those times that a bagel with cream cheese sounds amazing or a scone with a big cup of tea would make my day. And pizza? I used to love that stuff! My first two children grew in the womb on pizza because it was one of the few things that sounded appealing to me. I kind of figured I would just have to give up pizza altogether, but my aunt sent me a recipe this past weekend titled the “Best Ever Crispy and Flaky Gluten Free Thin Crust Pizza.” This sounded like a lofty claim to me, but I figured it was certainly worth the shot if I could enjoy one of my food loves again. 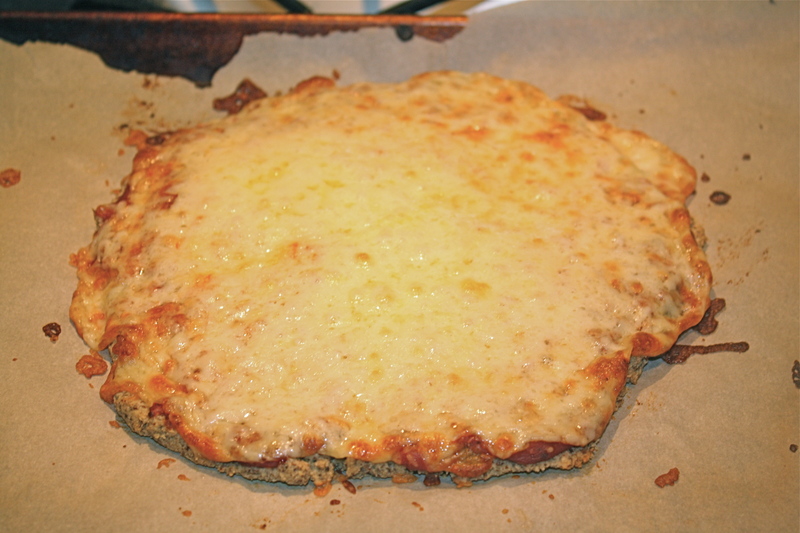 The crust was A-M-A-Z-I-N-G. Crispy, chewy, and not grainy in the slightest. It was sturdy and didn’t fall apart after it was loaded up with toppings. I wouldn’t say it is a dead ringer for the real thing, but it is without question the next best thing. We will be using this in my house time and again. My kids even ate it! 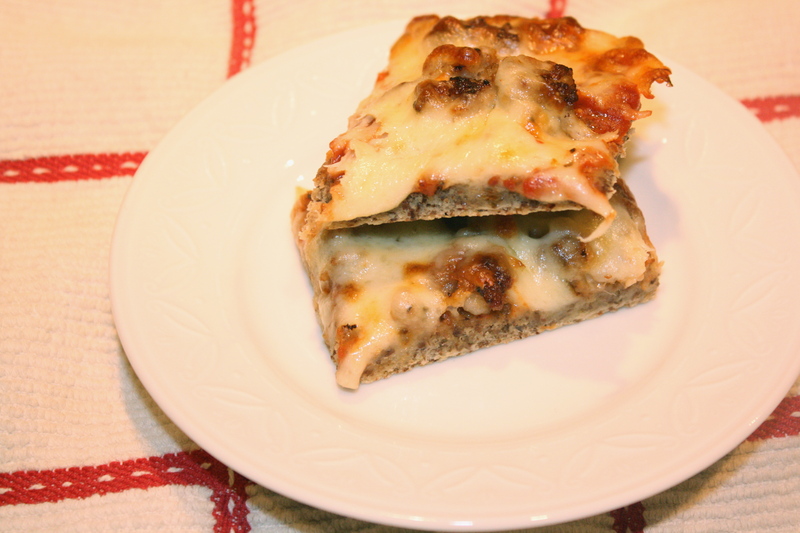 If you are gluten free or looking for a lower carb pizza option, look no further than this recipe. P.S. sorry for the lack of pictures but my lighting was terrible and there aren’t too many pics of pizza dough sans topping that look appetizing. Preheat the oven to 375 degrees. Mix almond meal, starch and baking powder in a bowl. Set aside. In another bowl mix flax meal, oil and water. Stir until the mixture thickens. Add the flax to the almond meal and stir until very well combined. Line two cookie sheets with parchment paper. Divide the dough between the cookie sheets . Press the dough out until it is about 1/16th of an inch thick. I intermittently dipped my fingers in oil to keep them from sticking to the dough. Pre bake the crusts for 22-25 min until the edges start to brown. Load up the crusts with your favorite toppings and cheese (dairy or non-dairy) and bake for 15-20 min until the cheese is melted. Last week it was absolutely roasting in the Midwest. Our relatively mild summer was slammed with a 90 degree finale. I was meal planning for the week and trying to come up with ideas that required little indoor cooking. I had made this chicken and quinoa salad earlier in the summer and my mom has been bothering me to remake it ever since. 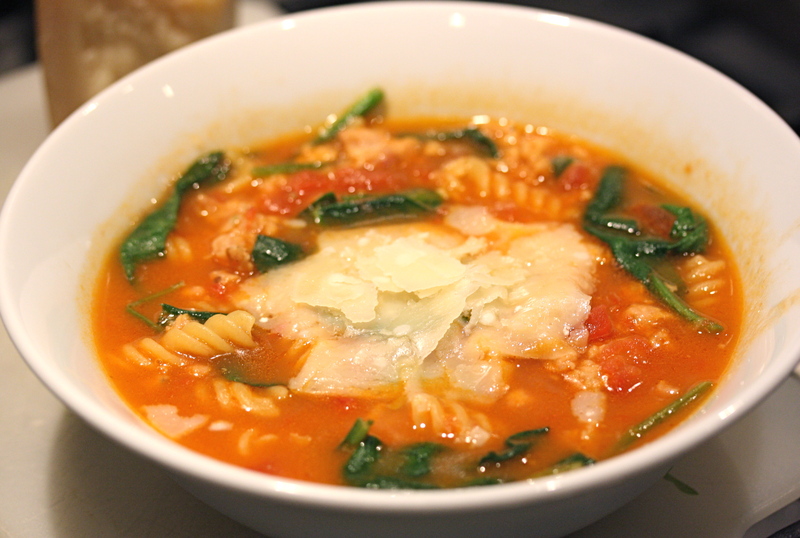 Since the recipe requires almost no indoor cooking, it was the perfect dish to make in the oppressive heat. The chicken portion of this dish is marinated in a mixture of fresh cilantro, lime and various spices, and because it is cut in small pieces and grilled as a kabob, every bite is packed with flavor. 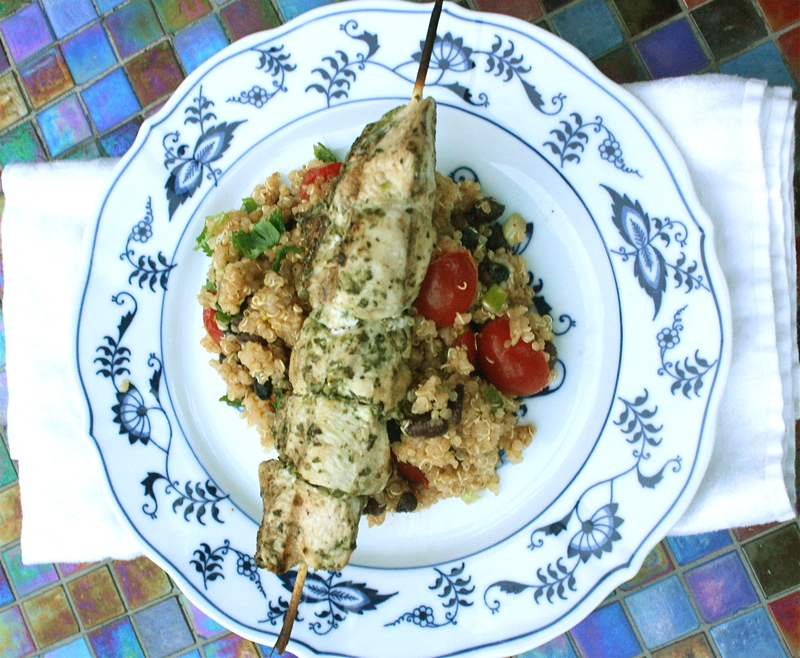 The quinoa salad is the perfect accompaniment to the chicken and has a fresh bright flavor from tomatoes, green onions and fresh cilantro and an added creaminess from black beans. A winning combination if you ask me! I should also note that I made zero changes to this recipe. This almost never happens to me. My friends laugh at me because I usually look at a recipe and think of things I can add or substitute to make the recipe better. 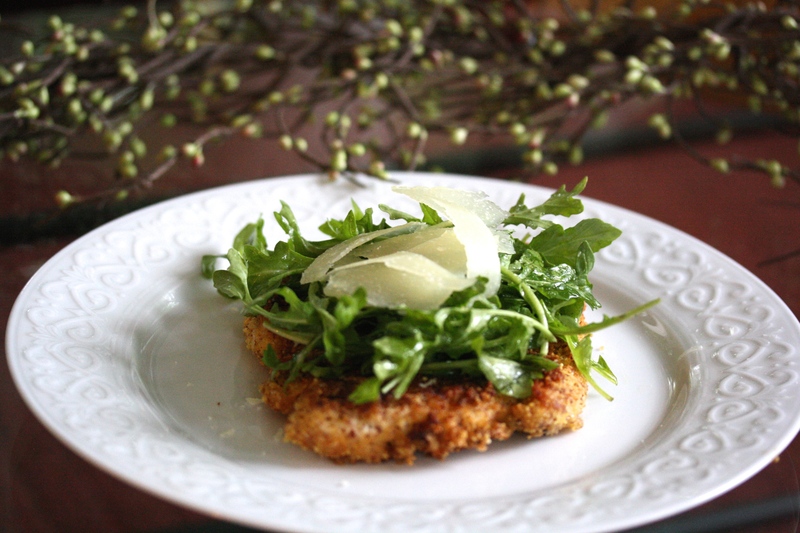 The flavors of this recipe, however, are so well balanced that they speak for themselves. 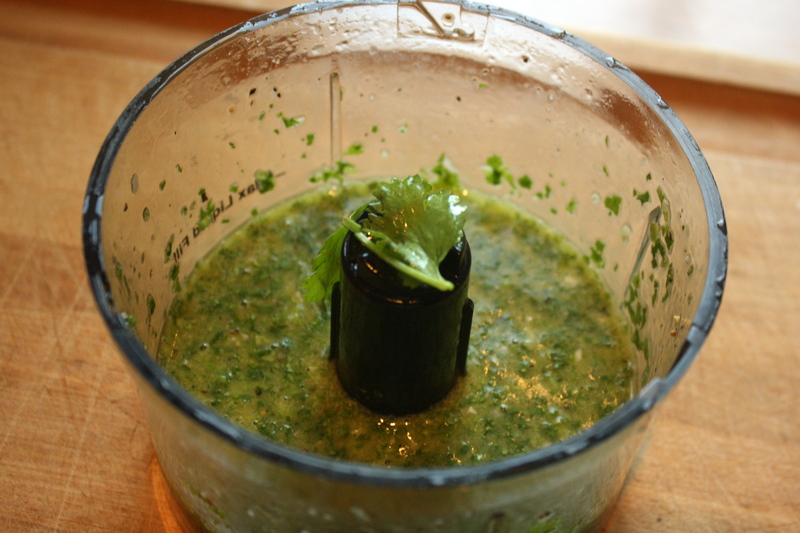 Start by blending cilantro, spices, oil and lime juice for the marinade. Chop 2 pounds of chicken breast into bite size pieces and pour the marinade over chicken. Allow to marinade for at least four hours. I did this step in the morning and let the chicken marinade all day. Cook the quinoa according to the package directions. 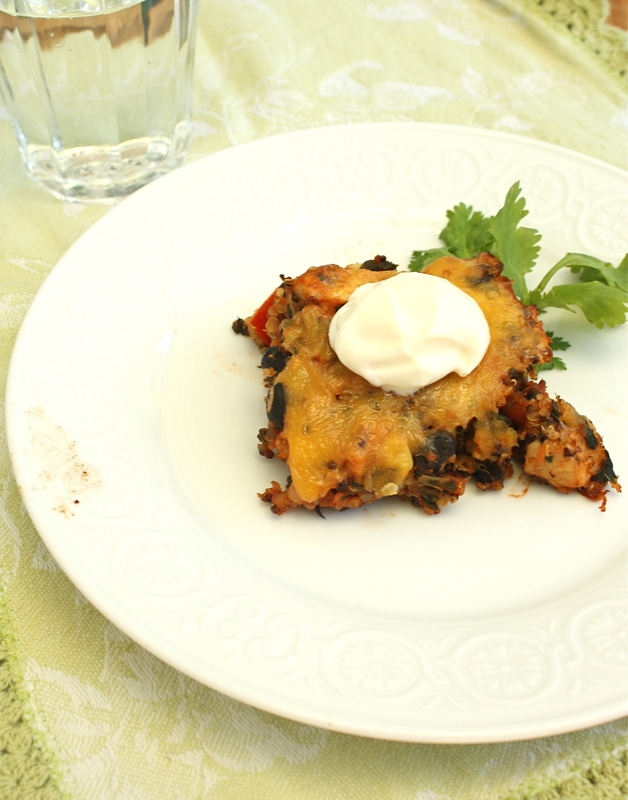 Let it cool slightly and then mix in chopped tomatoes, green onions, cilantro and black beans. 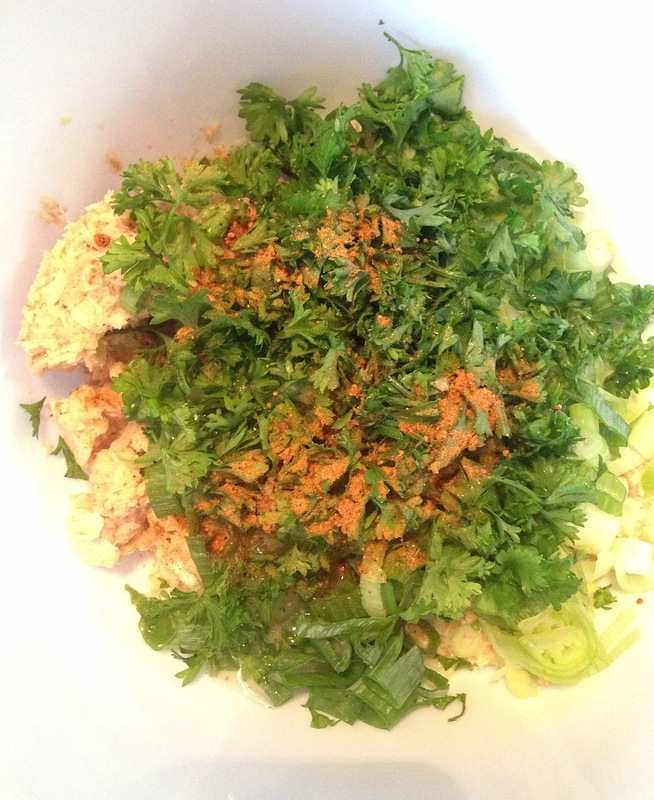 Whisk together lime juice, olive oil and several spices to create a dressing for the salad. Pour over the quinoa while still slightly warm and toss everything together. This salad can be served at room temperature or cold. Before serving, place several pieces of chicken on each skewer. Grill the kabobs for 15 minutes on medium high until cooked through. 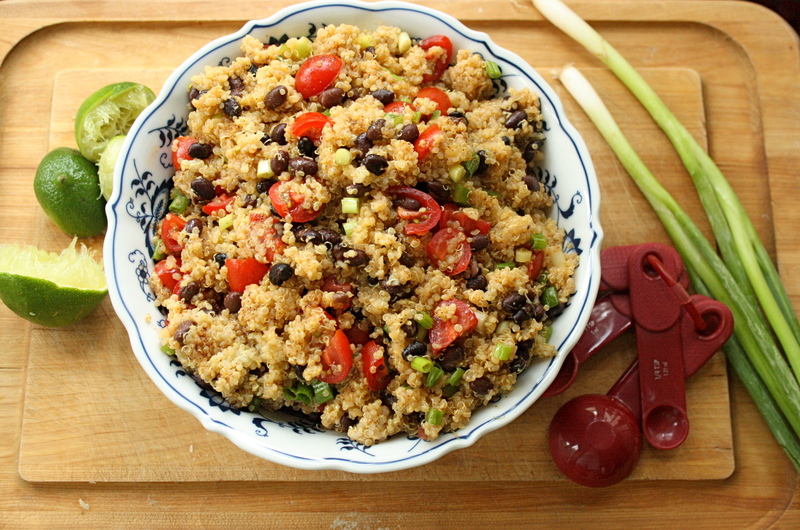 Serve warm over the quinoa. Cube the chicken and place in a gallon size ziplock bag. Blend together the garlic, cilantro, oil, salt and pepper together until smooth. Pour over the chicken and marinate for at least four hours. Cook the quinoa according to the package directions, using chicken broth instead of water. Whisk together the lime juice, oil, garlic, cumin, cayenne and salt. Set aside. Add the tomatoes, green onions, black beans and cilantro to the quinoa. Pour the dressing over the quinoa and mix all ingredients together. Serve room temperature or cold. Place 4-5 pieces of chicken on each kabob. Grill for about 7 minutes per side or until cooked through. 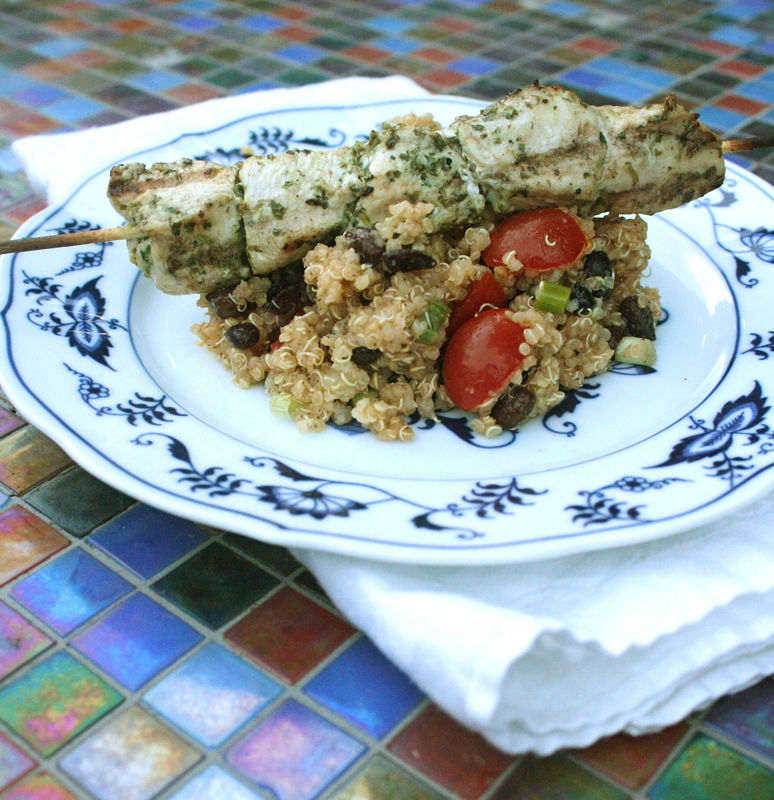 Serve on top of the quinoa. I have a limited diet; one which eliminates pretty much all meats aside from the occasional quality chicken or some sort of fish. That being said, when I get to have a little fish; I am excited! There is one problem though…..my husband hates fish unless it is fresh caught trout from Wyoming. Well, we’re in Georgia so that is pretty much impossible to accommodate. I came across this recipe in one of my cook books called The Gluten-Free Bible and immediately wanted to try it, though I knew I ran the risk of my husband gagging his way through dinner. I was pleasantly surprised to see him go back bite after bite until the entire plate was cleaned. I did a small victory dance in my head and ventured to ask how he liked them. He said he enjoyed them and that they didn’t taste fishy at all! Ah yes, sweet victory! The first thing you want to do for this recipe is start boiling your water for your 3 red potatoes; you will be mashing these later. 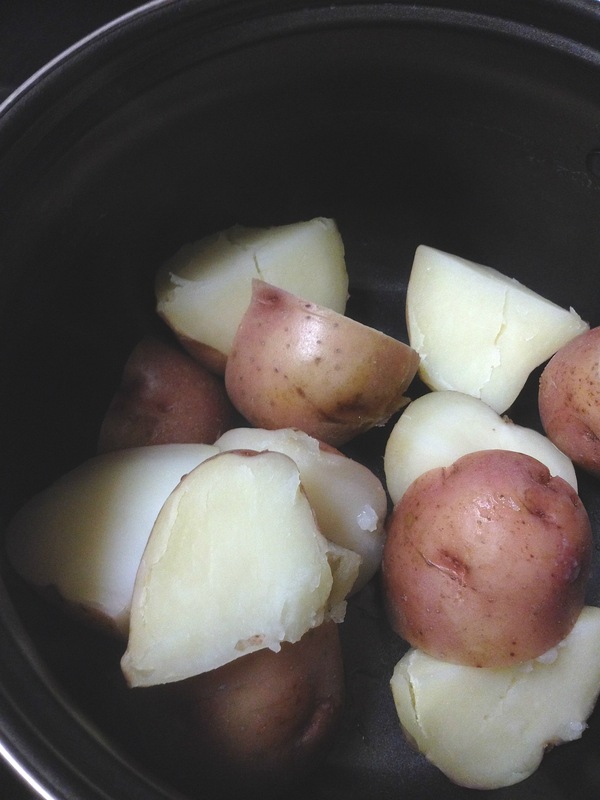 Salt the water a little bit to bring out more potato flavor, and leave the skin on for added nutrients. The recipe calls for fresh, cooked, and flaked salmon, which I’m sure would make the recipe even better. I, unfortunately, had to use canned salmon as the salmon here in the deep south is sub-par at best. I found that the canned salmon works wonderfully if you want to save a little money and time. Once you have mashed your potatoes, you will combine your fish, potatoes, green onions, egg white, parsley, and seasonings in a bowl. Once these ingredients have thoroughly been combined, allow them to rest so the flavors begin to meld together. While this mixture rests, start constructing your tartar sauce by combining mayonnaise (use veganaise in place of mayo and yogurt if you are dairy free), yogurt , mustard, pickle, lemon juice, and parsley. Mix well and let rest while you finish your salmon patties. Then, simply form your potato mixture into patties and brown on each side in an oiled, hot skillet. Serve with a dollop of the fresh tartar sauce on top and prepare to feel like you’re eating at a seafood restaurant. Tip: This recipe is only supposed to make two generous patties. I was able to make four because I had too much potato in my mixture. Be sure to use 3 very small red potatoes or 2 medium sized. 2. 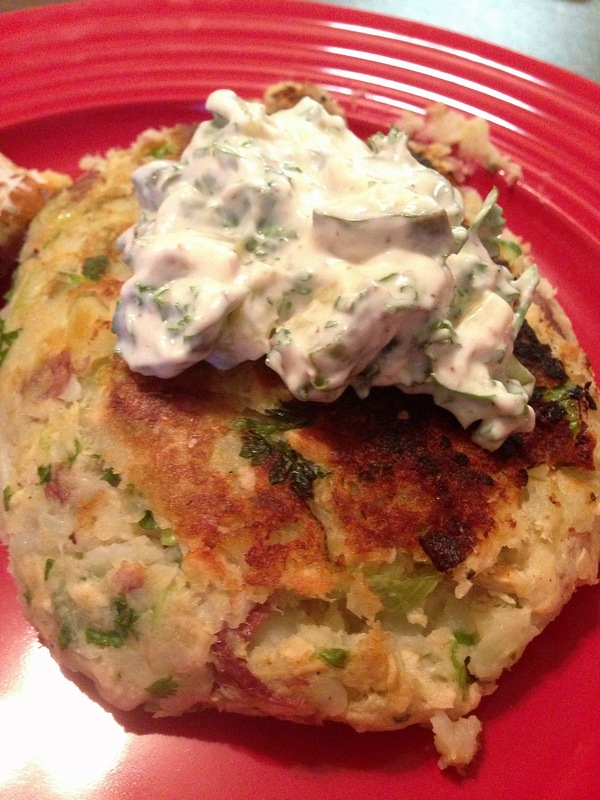 Combine potatoes, salmon, green onions, egg white, 1 Tbs. parsley, and seasoning in medium bowl. 3. Heat oil in medium nonstick skillet over medium heat. Gently shape salmon mixture into 2 patties. Place in skillet; flatten slightly. Cook 7 minutes or until browned, turning once. 4. Meanwhile, combine mayonnaise, yogurt, mustard, pickle, lemon juice and remaining 1 Tbs. parsley in small bowl. Serve with cakes. Makes 2 servings. There was a night a few weeks ago that I spontaneously invited one of the army couples we know over for dinner. I usually invite people over before I even know if I can make a recipe stretch from 2 to 4 servings, but hey it keeps life exciting right!? This particular recipe was very forgiving as most rice recipes are as far as serving sizes; it made my spontaneous invitation a breeze to accommodate. Plus it was delicious! So delicious, in fact, that the girl who had come over told me she wanted more of my cajun chicken soon while I was grocery shopping with her today. I thought this generous compliment warranted me posting the recipe to the blog. Hope you enjoy! The recipe calls for chicken drumsticks and thighs, but since I don’t eat meat and I knew I was serving three other adults I thought it would just be easier to use chicken breasts. 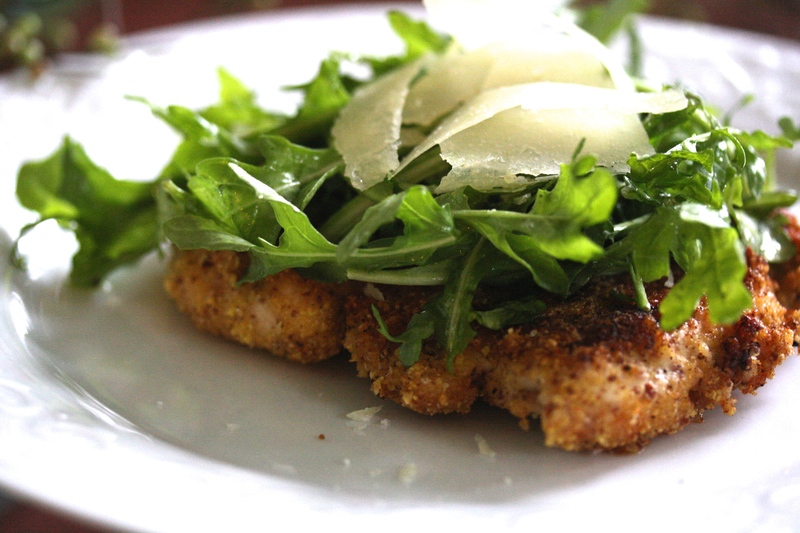 Plus my husband enjoys chicken breasts the most….so I am biased to using them in recipes. 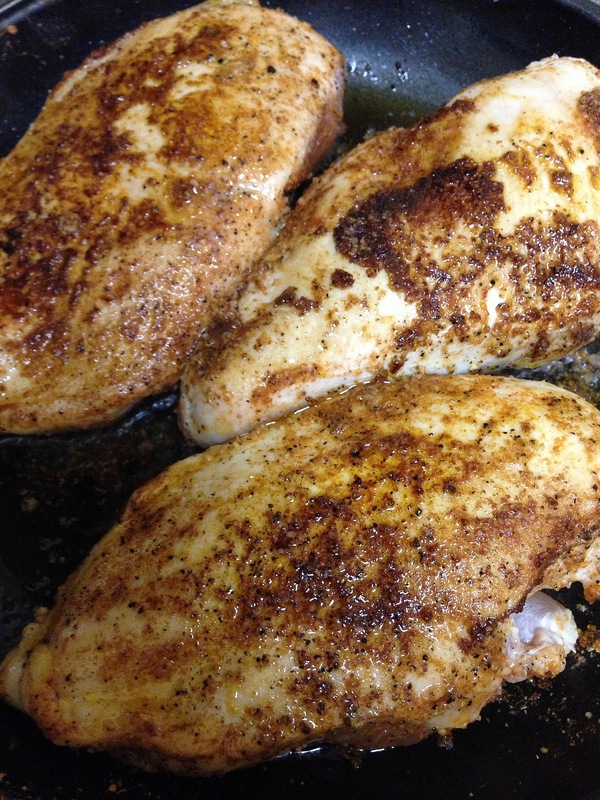 The chicken is sprinkled with cajun seasoning and browned on both sides in an oiled skillet. Set aside the chicken to rest and deglaze the skillet with chicken broth. Add the rice, bell peppers, green onions, garlic, thyme and turmeric. Allow to cook for just a few minutes and be sure to get all those yummy brown bits off the bottom of the skillet. Prepare a 13×9 inch baking dish with some cooking spray, then just simply pour the veggies and rice from the skillet into the baking dish. 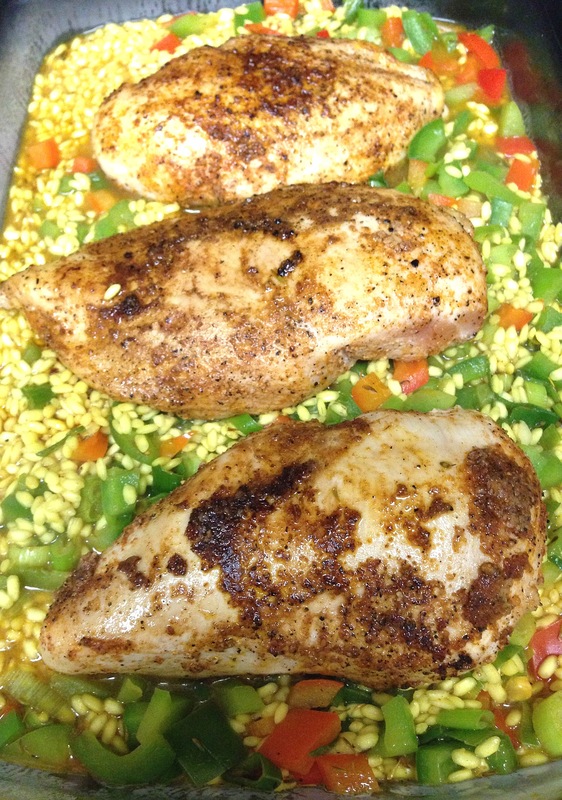 Place the browned chicken over the top, cover with foil, and place in the oven to cook for an hour. 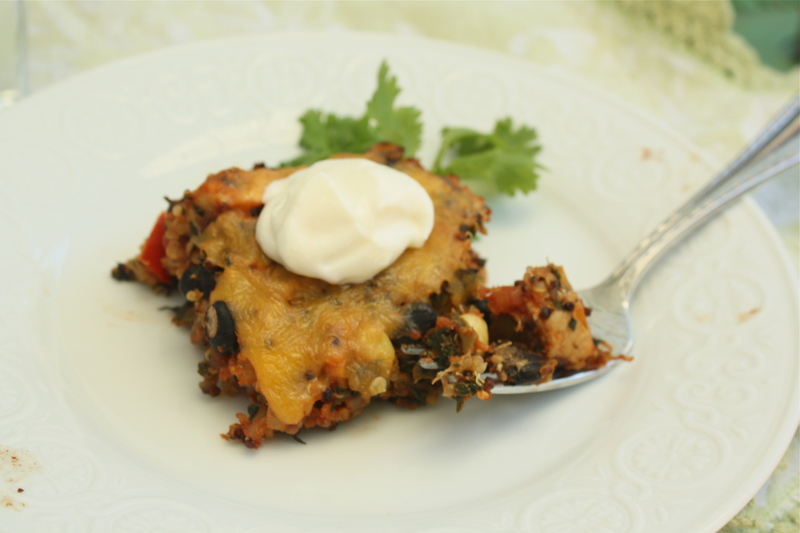 So delicious and so easy to tweak to serve a crowd! 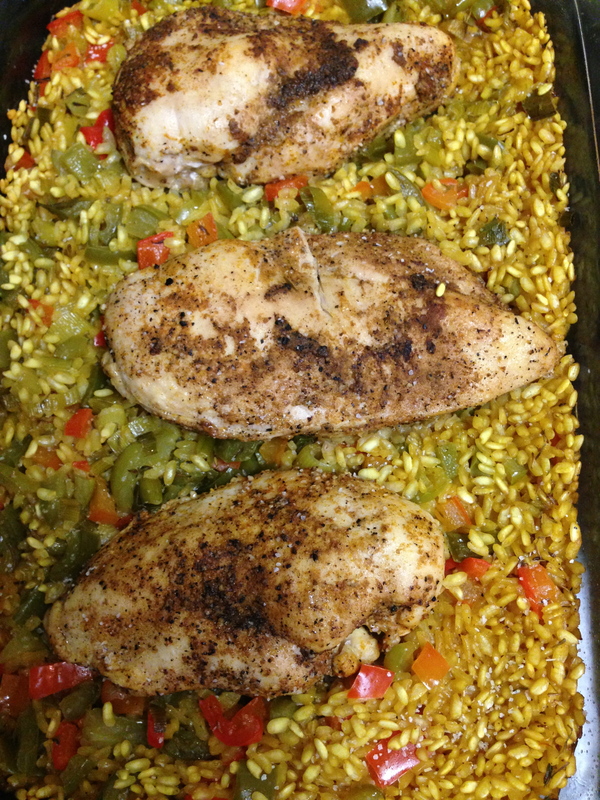 Tip: I used arborio rice. 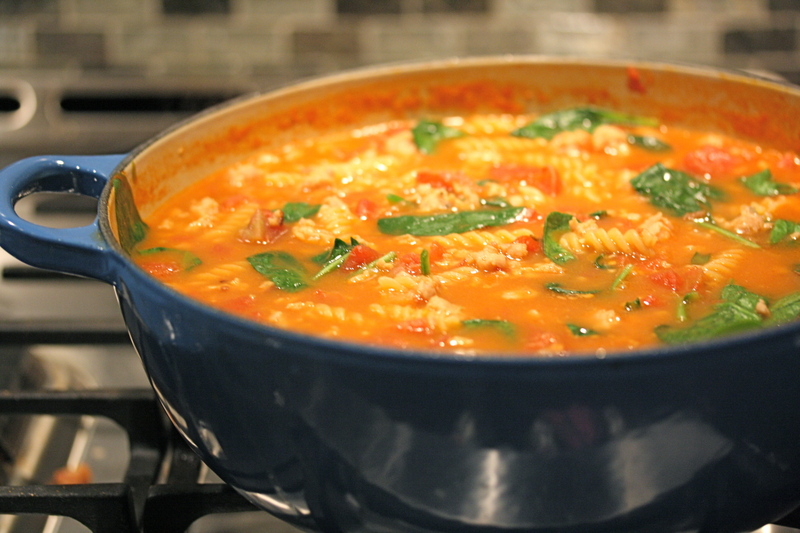 This rice soaks up all the yummy juices and tastes rich and creamy with hardly any added fat. 2. Sprinkle both sides of chicken with cajun seasoning and salt. Heat oil in large skillet over medium-high heat. Add chicken; cook 8-10 minutes or until browned on all sides. Remove from skillet. 3. Add broth to skillet; bring to a boil, scraping brown bits from bottom of skillet. 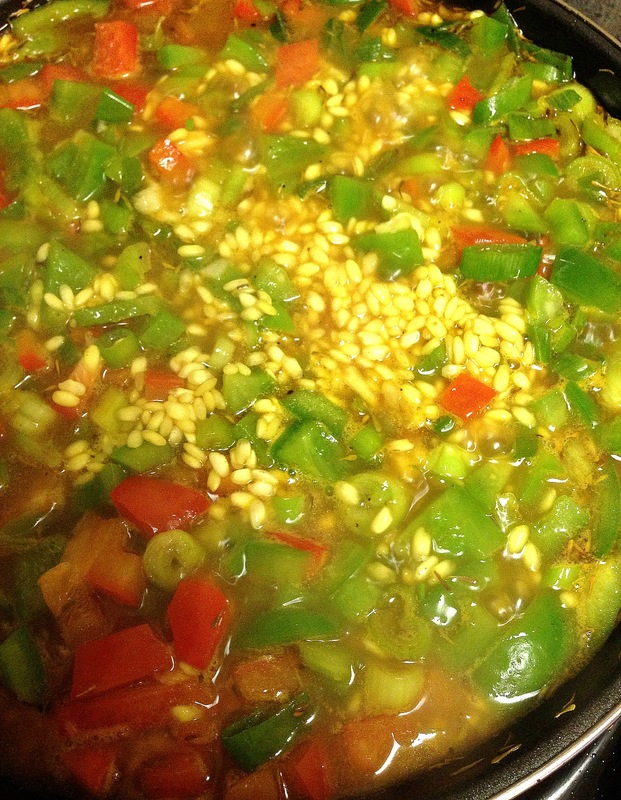 Stir in rice, bell peppers, green onions, garlic, thyme, and turmeric. Pour into prepared baking dish. Place chicken on top. Cover tightly with foil. Bake 1 hour or until chicken is cooked through. I think I have mentioned before in my other posts that the price of meat has gone up. I feel as though this is a great opportunity to get creative in the kitchen with ingredients you might not be the most comfortable with but that are more affordable than others. A whole chicken, for instance. A whole bird tends to intimidate people, but I promise you this recipe will be one of the easiest meals you have ever put together and it will look like you are a skilled culinary chef. That’s a success in my book! Start by allowing your chicken to come close to room temperature; 30-40 minutes before preparation should do the trick. Be sure to clean out the insides of the bird before seasoning. Don’t worry, most of the time the chicken is already cleaned out. Once your chicken is cleaned, drizzle a small amount of olive oil over the bird and sprinkle generously all over with kosher salt and pepper. Now for the fun part; time to brown your bird. Heat some oil in a skillet and place your bird in the hot skillet. In 5 minutes or so flip the bird to the other side. 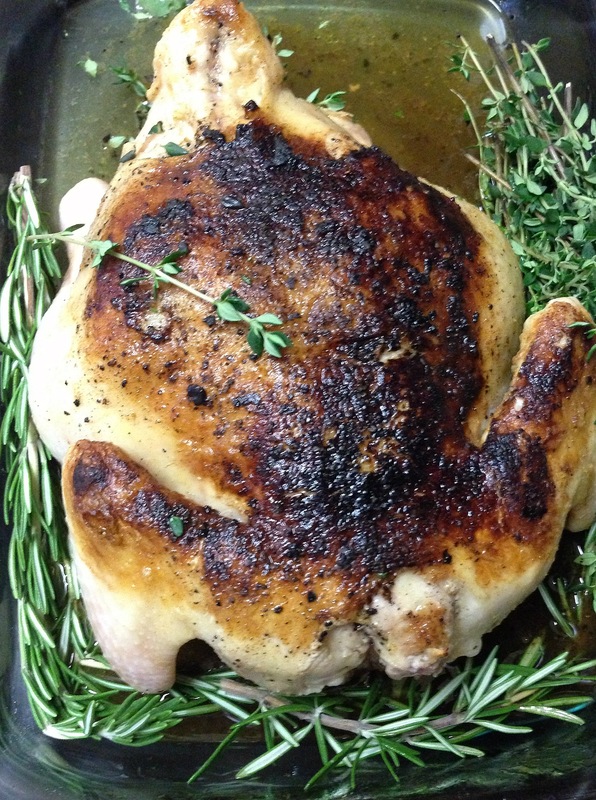 Place the chicken in a baking dish breast-side down and surround with sprigs of fresh Rosemary and Thyme. Stuff more rosemary and Thyme inside the chicken. So much flavor! Doesn’t it look pretty already!? Now, all there is left to do is cut the veggies and disperse around the chicken. Be sure to add the chicken broth to the baking dish before putting the chicken in the oven so everything stays juicy and delicious. The hardest part of this recipe is waiting for the chicken to get done! 1. Preheat oven to 400 degrees and begin preparing your bird with seasoning. 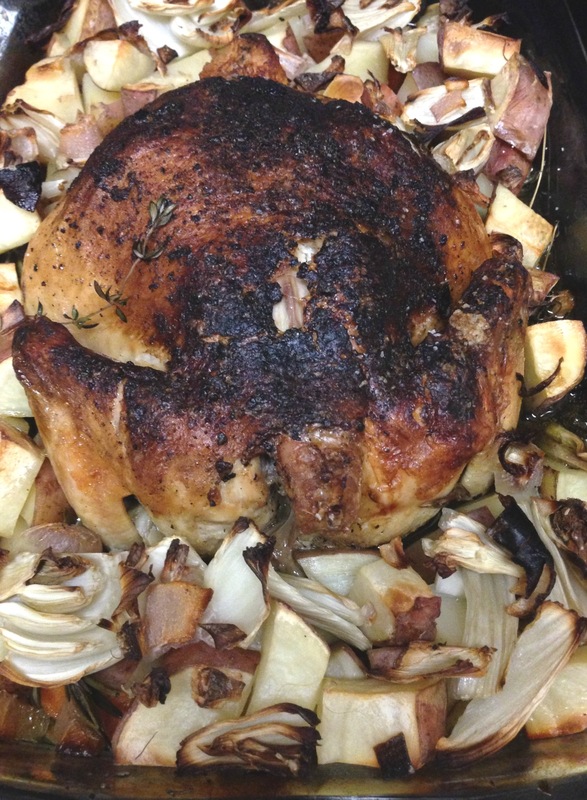 Brown your bird in a heated skillet and set aside in a baking dish. Pour chicken broth into hot skillet to deglaze the pan. 2. Surround the bird in the baking dish with Thyme and rosemary sprigs; stuff more inside the bird. Pour the chicken broth over the bird from the skillet. 3. 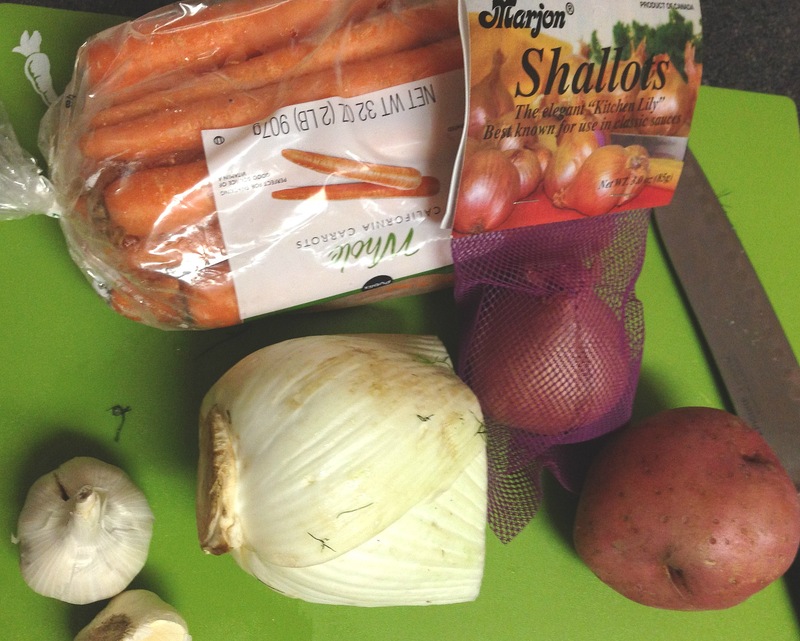 Cut up all vegetables including the shallot and garlic and surround the bird with the vegetables. 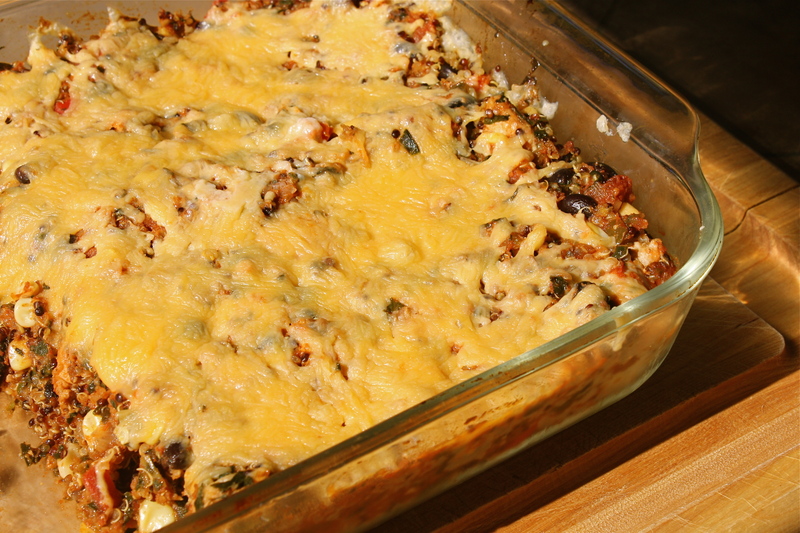 Place baking dish in the oven and allow to bake for 1 1/2 – 2 hours.